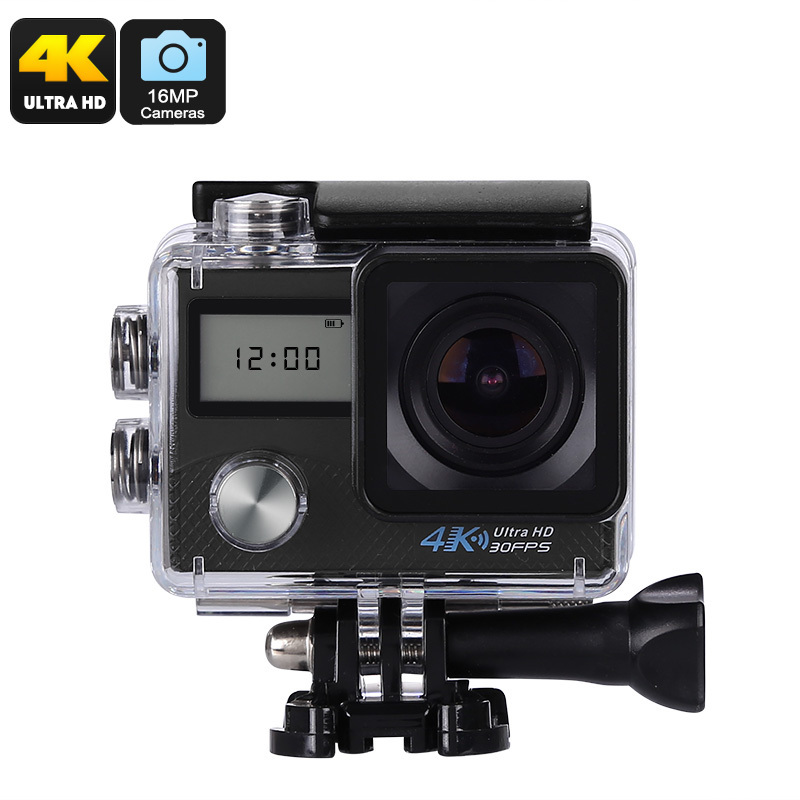 Successfully Added K2 Sports Action Camera - 16MP CMOS Sensor, 170-Degree Lens, 2-Inch Display, 4K Video, IP68 Waterproof, WiFi (Black) to your Shopping Cart. With this compact K2 sports action camera at your side, you’ll be able to snap stunning pictures and Ultra-HD footage of all your upcoming outdoor adventures. With its miniature size and lightweight, this action camera can be easily carried around anywhere you go. It can either be attached to your equipment with one of its many hooks and clips, or it can be used as a regular handheld camera. This 4K sports action camera features a number of different shootings modes to meet all your filming demands. With its 1050mAh battery, it will get you through an hour worth of continuous filming. This 4K action camera features a high-end 1/32-Inch 16MP CMOS sensor from Sony. This little sensor allows you to shoot crisp 16MP pictures as well as 4K footage at 30fps. Along with its 170-degree lens, you can be guaranteed that not a single detail stays uncaptured while filming with this sports action camera. All your recordings can be viewed back instantly on the action camera’s 2-Inch rear display. Therefore, you can be guaranteed that all your pictures and videos are always of the highest quality. The K2 sports action camera supports WiFi connectivity. This allows you to easily pair it with your iOS or Android smartphone via the dedicated Application. Thanks to this, you’ll be able to easily share your recordings instantly onto your smartphone from where they can be edited or shared further with friends and family. The camera itself also holds a 32GB SD card slot that allows you to store plenty of your recordings. With its IP68 waterproof case; this sports action camera lets you record your upcoming adventures in any environment imaginable.